Reebok’s Toning settlement should be taken into context. While it never appeared to us to be a sustainable biz, it did shift share around a bit. The trend has been self-correcting for 11-months now. So we’re not concerned about it ‘going away.’ In fact, a simple look at Nike’s US order book tells us where these toning dollars are going. At its peak in mid-2010, we estimated toning to be just over a $1Bn category domestically and roughly $500mm internationally, at retail. At that time, the toning category was contributing up to 4%-6% to overall footwear sales growth in the athletic specialty channel. This benefit was fleeting. By October 2010, the category was a drag on consolidated growth in the industry as demand slowed abruptly. Meanwhile, the industry excluding toning was growing at a rate from mid-single-digit to low-double-digit. 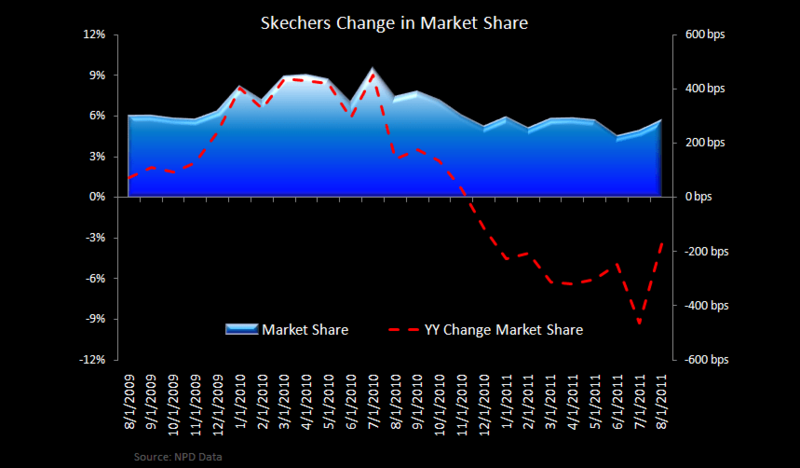 With Skechers and Reebok left severely over-inventoried heading into the shift in demand, the discounting began. 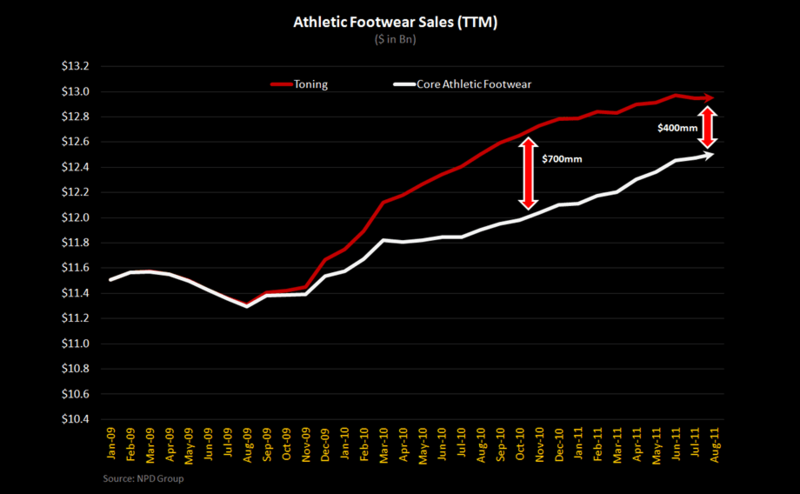 With prices for toning shoes still now at roughly half of where they sold at the peak, the category has contracted to a what is now a ~$500mm category domestically – similar in size to categories like occupational and cold weather casual boots. What is perhaps the most notable callout throughout what can now be dubbed as the ‘toning fad’ is Reebok’s ability to leverage the trend to regain relevance. 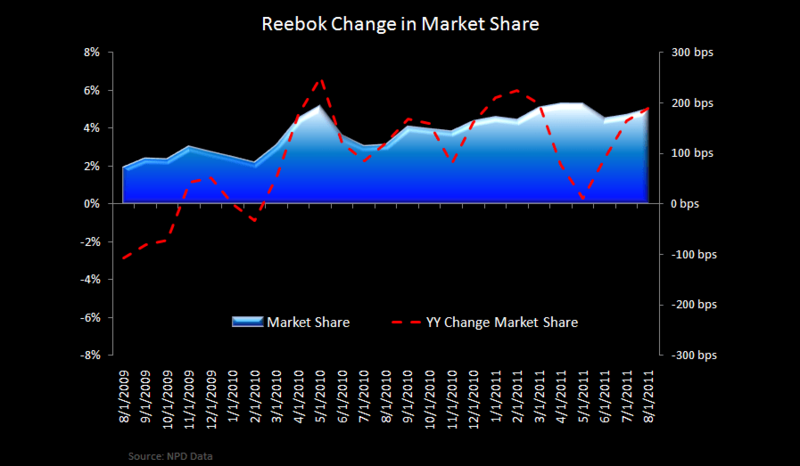 Take a look at the two charts below illustrating both Reebok and Skechers’ market share gains both during, but more importantly following the toning cycle. SKX gained 4 points of share in the industry only to give it all back to ‘real’ innovation leaders like Nike and Adidas. Reebok on the other hand gained 2-3 points of share initially and has continued to take share as it rolled its success directly into its latest ZigTech offering. Keep in mind that Skechers started from a larger base (6% share of the industry) with its stable brown shoe and growing kids business while Reebok represented an inconsequential 2% of the industry. For what it’s worth, they both now have about a 6% share. At this point, there’s definitely a risk that Skechers is forced to pay a similar settlement to the FTC for its own advertising claims. Is it going to move the needle for the company, no. 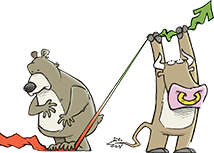 From an industry perspective, we are a month away from the point when comping toning growth is an afterthought. In fact, over the last two quarters, footwear and sporting goods retailers alike have noted that the benefit of the latest lightweight running category has more than offset the impact of lost toning sales. The industry has moved on, so should we.